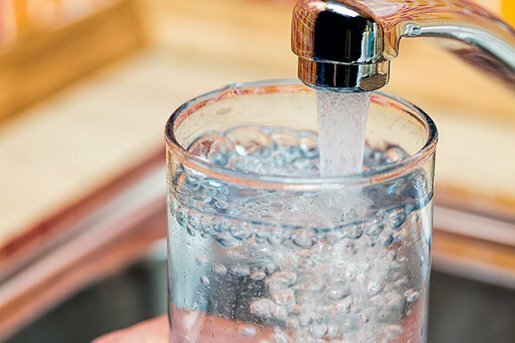 Reverse osmosis water filtration (RO) systems physically remove pollutants from water: Water from your cold-water supply line is fed into a series of filters that remove nitrates, pesticides, sulfates, fluoride, bacteria, pharmaceutical products, arsenic, chlorine and chloramines, and so on. RO systems have been used by many municipalities since 1977, so it’s a tried-and-true way of delivering better tasting and cleaner water to your home. How Does an RO Water Filtration System Work? Your plumber fits a valve onto your cold-water supply line. The valve attaches to the RO’s pre-filters, which remove sediments and chlorine. That water then goes through a semipermeable membrane to remove many aesthetic and health-related contaminants, as listed above. The purified water then passes into a pressurized water tank where it is stored for your eventual use. When water leaves the tank and enters your faucet, it generally passes through a carbon filter that removes any remaining impurities and freshens the taste. How Do I Decide Which System to Install? If you are mostly concerned about improving the quality of your drinking and cooking water, then a small RO water filtration system, with a holding tank of about four gallons, is your best bet. A whole house RO system may be the best choice when contaminants and other impurities affect the efficiency and the lifespan of your plumbing system and appliances (dishwasher or washing machine), or when there are concerns about the safety of the water entering your main water line. Where is the RO Water Filtration System Installed? Look no further than under your kitchen counter. A small RO water filtration system, which has a dedicated faucet, can be installed near the kitchen tap and can also connect to your refrigerator and ice machine. This system is primarily intended to serve your drinking and cooking functions. If you decide on a whole home filtration system, the installation is located near the primary water line, usually found in your mechanical room. Filtered water is kept in a large tank, and flows to your secondary lines: water heater, laundry, bathroom and even your outdoor faucets. Household water pressure pushes water through the RO membrane and additional filters; impurities are filtered out and subsequently flushed down the drain. Are RO Water Filtration Systems Expensive? An under-counter filtration system ranges, on average, between $200 and $500 per unit plus installation costs. Filters need to be replaced only occasionally. Once installed, under-counter RO systems cost pennies a i day per gallon of water used, a bargain when compared to the cost of bottled water and/or home delivery of filtered water. A whole-house installation is much more expensive to purchase and install due to the greatly increased capacity and the necessary plumbing modifications. If you have concerns about the safety of your drinking water, if you are tired of the cost and bother of providing bottled water, or if you simply want to improve the taste and character of the water coming out of your tap, talk to us about installing a RO water filtration system that fits your needs. We’ll help you figure out if your water supply will benefit from an RO installation, and what system will work best for your household needs.